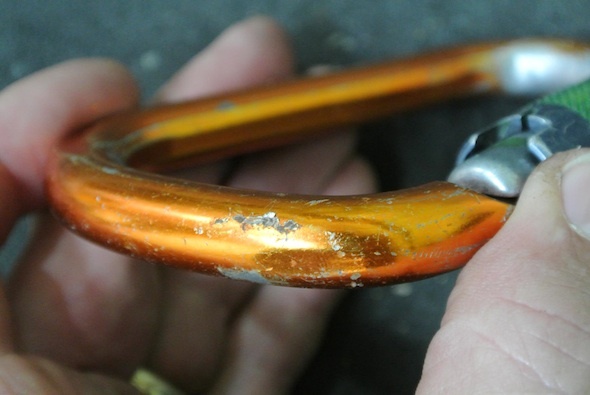 This is a controversial topic that comes up every so often and which, due to the often singular importance of carabiners, is worth some further research. Firstly, lets look at some of the specific testing that has been done on the topic. Basically they all boil down to dropping some ‘biners from a great height, setting up an industrial tension rig and testing said ‘biners to failure. A summary of a few such reports follows. Closer to home we have a new test rig set up in Katoomba that is churning out some very interesting results (and is always looking for some damaged ‘biners to test). Richard has started a facebook group that includes lots more discussion and videos of ‘biners being loaded until failure. He has for instance tested 6 locking gate carabiners (3 x aluminium, 3 x steel) that were dropped 255m onto a steel plate (a fairly extreme scenario). 3 aluminium biners: 1 landed on crotch and impact resulted in complete gate separation. Destructive pull-test performed (gate open). Failed at 19.20kN (rated gate-open strength 20kN). Another survived with gate intact and failed at 23.79kN (rated to 24kN). A video of the later is here. This was a very small sample size. However even with a sample size of 1000 one cannot be assured that number 1001 may not land in a particular orientation and suffer some undetectable damage resulting in a significant loss of strength. So what would be a good legal recommendation for a website to make? (legal disclaimer; no one in any way associated with this post is qualified or generally recommendable for legal advice) Follow the manufacturers’ instructions with regard to use, inspection, and maintenance for all your equipment. If they say destroy after a significant fall then send it to “Rope Test Labs, PO box 193, Katoomba, NSW 2780” and Richard will gladly destroy it for you. This is a way for them to increase their sample size and thus validity of the results (so we can follow their recommendations with greater trust). In a test conducted by REI, thirty carabiner bodies (half ovals, half Ds) were each dropped six times onto a concrete floor from a height of 33 ft. (10 m). Following the drops, their open-gate strength was measured and compared to thirty control samples from the same production batch that had not been dropped. The statistical result was no loss of strength. At the International Technical Rescue Symposium, 2000, Garin Wallace and Kevin Slotterbeck of SMC presented data on the strength of carabiners that had been dropped 27’ or 54’ onto concrete or asphalt. One by one, they dropped 115 new, SMC locking D aluminum carabiners. Then they broke the carabiners, measuring the breaking strengths. What do Garin and Kevin say about using climbing hardware that has been dropped? Retire your hardware if you drop it (they do work for a manufacturer, after all). What do their numbers say? 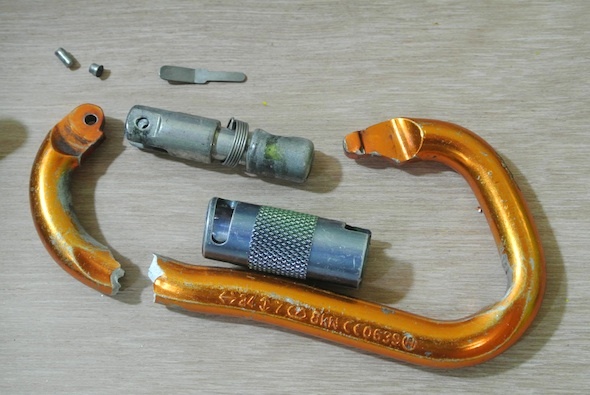 The carabiners that were dropped were no weaker than the un-dropped carabiners. In fact, the average strength of the dropped carabiners was slightly stronger than the un-dropped carabiners, but the difference was not statistically significant (during the presentation a certain engineer from an unnamed airplane manufacturer in the Seattle area was heard muttering something about forge hardening). All in all the data from these diverse range of experiments using a mix of different ‘biners seems to be confirming the same thing, that unless there is clear visual damage it is unlikely the ‘biner has been weakened. That said, when it comes to essential safety gear that is used in life and death situations, it is probably best to err on the side of caution. Finally, if you want to inform yourself about some more rope work related concerns / myths you can check out ‘On Rope’ by Smith and Padgett, onrope1 (not related to the book) and geir hundal. Some of these are climbing specific but most are life and death issues for every canyoner.